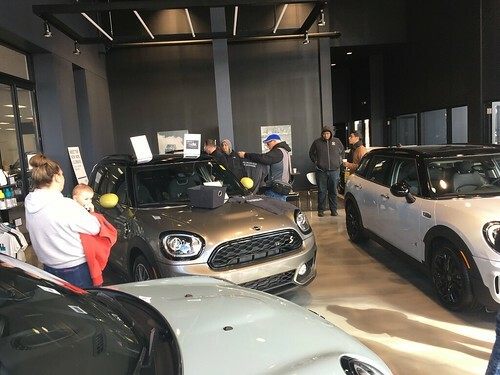 WRAPUP: We had about a dozen MINIs head out for a 20 mile scenic backroads drive, and arrived together at the Micro Car show. Several CMMC members were displaying their MINIs as well as other very cool cars. Almost 400 Micro and Mini cars of all shapes, sizes, and conditions were on display. One group travelled all the way from California along the old Route 66 drive. Volo museum also had a large number of much larger cars for sale inside, with price tags from the low thousands up to a Corvette valued at over $100,000. This was truly an amazing show and a bunch of amazing cars. Huge thanks to Arnie and Lena for being amongst the small group of people that has spent the past 4 years organizing and planning to make this event as spectacular as it was!! Come on out to the biggest small car show in the world!! The Micro/Mini car World meet will be held in Crystal Lake on August 21st. Hundreds of unusual Micro (under 500cc) and Mini (under 1600cc) cars will on display for you to look at and possibly even get a ride in. There is a category for our big MINIs if you would like to enter your car in the show, or take a short group drive to attend the show as a spectator. WHERE: 100 South Main Street, Crystal Lake. Lena and I will be there. Especially since we are one of the four host couples. If you were there in 2006, nothing more needs to be said. If you were not there, It’s a really unique show and a lot of fun. We have put four years into the planning of this event. Hope to see you there. I told my son about this,and he became very excited. So we will be there. I will definitely be there. Already have my Illinois Specialty plate # 5. Can’t wait! This should be the first event I can make since April! My foot should be good to go by then. So see you there! We are planning on attending! I plan to be there–maybe two of us. I did’nt know where to post this. Is anyone going to culvers ? Hi Jerry.. We’ll be posting the time details for the Culvers September 18th get-together in a week or so..
See you at the meeting spot on Saturday! Check out Micros on Route 66 on Facebook. They are coming to the World Meet from CA. There will be lots of press and a 3D movie being made as well. Ya don’t wanna miss it! We are preregistered at 325 cars and expecting MANY more to register on site. Spectate for free or register your car, you decide. C U THERE!!! My son is really excited! Looking forward to a great drive and show. Bringing my son’s friend and dad so they can see what this “mini/micro” thing is all about! hey everyone!! I just found out a couple of MINI friends from the STL MINIs are coming up for this! Can’t wait!! I’m in the Chicago area for a couple of weeks, so I’ll be there..
Will try to make it! Might come over later on. See you all there! Great show. That’s right, the tattoo is mine, I’m in love, with MINI that is. ice cream truck. It was a great day. Just wanted to thank everyone for coming. This was a “Super” show. I really want to give a BIG THANK YOU to all the Organizers and visitors to the meet. I’ve participated in shows with full size cars.But they don’t compare to the fun I had at this one. This was my first show I brought my Velorex to.And I thoughly enjoyed being a part of it.The road tours and the drive around were a Special treat.